The Shakespeare Story Trail from Royal & Derngate and written and directed by Erica Martin with stellar production from Helen Gibb, was a tour de force, as through elaborately organised perfection we traversed Northampton. We visited thirteen different locations within Northampton town centre, and following a coach trip, in Abington Park, this was a delight of not only street theatre, but interactive and education as well. Our hosts for the event were William Shakespeare (Davin Eadie) and his mischievous fairy, Puck (Keith Maddern). William is suffering writers block working on his play and needs some inspiration so he invites us to journey with him around the town for wonderful ideas. So via Northampton Castle, Hazelrigg House, Market Square, Royal & Derngate and ending at Abington Park, we meet many a character from the bards tales and stories from history. Those thinking that this was just a walking tour (as was my companion of the day) were in for a big surprise. Throughout our journey there were conga's on the square, mask and ruff making, hats with sheep, a ball with dancing and bagpipes and chants of "knock! knock!" and "PUCK!" It all combined to make an incredibly entertaining afternoon and was also wonderfully enjoyed by the many children also on the journey. Here is hoping that this is the start for them of a life of theatre loving. Our two travelling companions were magnificently played by Eadie and Maddern, breathing life into their characters and maintaining them exceptionally well in their banter on the journeys between locations. They were also complimented with a tremendous band of actors in the other roles, resourced from ex-University of Northampton student actors, R&D Youth Theatre and Actors Company members and Masque Theatre. It was an absolute delight to see them coming together as one to create such an immersive atmosphere for this anniversary. So a fabulous and slightly unexpected delight, as I could never have imagined that this would provide such an fulfilling two and a half hours of entertainment (and at staggering value) as it did. It was pinpoint perfect in its organisation, especially considering the number of outside variables that could have occurred. It was a tremendous achievement for all involved and was wonderful to be a part of. Performance reviewed: Saturday 23rd (afternoon), 2016 at the Royal & Derngate, Northampton. 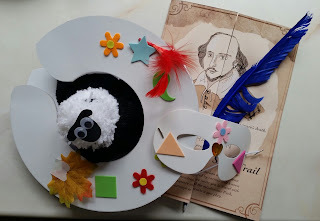 The Shakespeare Story Trail was held on Saturday 23rd and Sunday 24th April, 2016 only.